[145 Pages Report] The energy cloud market size is expected to grow from USD 5.12 Billion in 2016 to USD 15.18 Billion by 2021, at an estimated Compound Annual Growth Rate (CAGR) of 24.3%. 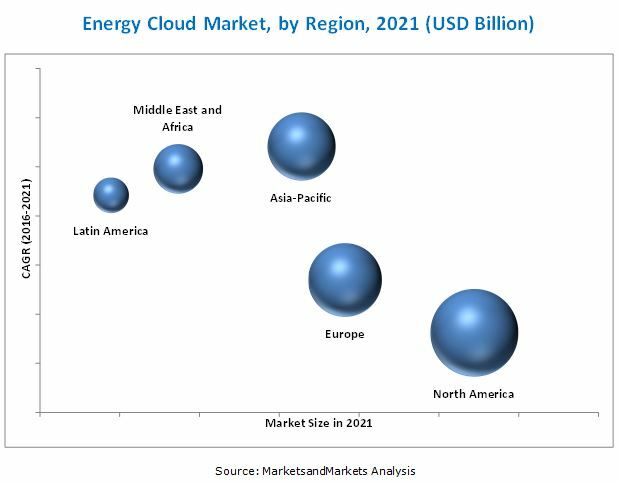 The energy cloud report aims at estimating the market size and future growth potential of the market across different segments, such as solutions, services, deployment models, service models, organization sizes, and regions. The primary objective of the report is to provide a detailed analysis of the major factors influencing the growth of this market (drivers, restraints, opportunities, industry-specific challenges, and burning issues), analyze the opportunities in the market for stakeholders, and details of the competitive landscape for market leaders. The energy cloud market comprises vendors, such as Accenture PLC (Chicago, Illinois, U.S.), IBM Corporation (New York, U.S.), HCL Technologies (Noida, India), SAP SE ( Walldorf, Germany), Cisco Systems, Inc. ( California, U.S.), Oracle Corporation (California, U.S.), Capgemini (Paris, France), TCS (Mumbai, India), HPE (California, U.S.), Microsoft Corporation (Washington, U.S.), and Brillio (California, U.S.). Vendor comparison analysis provides information about the major players, who offer energy cloud services & solutions and outline the findings & analysis, on how well each energy cloud market vendor performs within our criteria. The energy cloud market is expected to grow from USD 5.12 Billion in 2016 to USD 15.18 Billion by 2021, at a Compound Annual Growth Rate (CAGR) of 24.3% during the forecast period. The demand for the market is driven by factors, such as rising aging infrastructure and grid security concerns. The growing need for enterprises to have Customer Relationship Management (CRM) is fueling the growth of the cloud energy market, globally. The enterprise asset management solution segment is estimated to have the largest market share during the forecast period. The solution offers various benefits, such as real-time visibility into asset usage and govern them & improve the return on assets. Energy cloud players provide asset management solution, which helps in clear visibility and control over critical assets that affect the risk & compliance. The managed services segment is expected to experience the highest growth during the forecast period. This service helps manage upstream and downstream oil & gas and nuclear & smart grid management of the energy and utility enterprises. Moreover, all the pre and post-deployment queries and needs of customers are addressed under managed services, for which, companies outsource services to offer customers on-time service delivery. North America is expected to have the largest market share in 2016, whereas the Asia-Pacific (APAC) region is expected to grow at the highest CAGR from 2016 to 2021 in the energy cloud market. The U.S. and Canada are the major regions contributing to the North American region, due to the presence of large number of enterprises and higher adoption of advanced technologies. Increasing amount of cyberattacks and stringent regulations & compliances are the challenges and restraints for the enterprises, such as energy and utilities. The key vendors in the energy cloud market are Accenture PLC, IBM Corporation, HCL Technologies, SAP SE, Cisco Systems, Inc., and Oracle Corporation. These players have adopted various strategies, such as new product developments, acquisitions, and partnerships to serve the energy cloud market. Continuous technology innovations is an area of focus for these players, in order to maintain their competitive positions in the market and promote customer satisfaction.